Take This Serious » RIP TO ONE OF BOXING’S GREATEST TRAINERS+COMMENTATORS IN HISTORY: EMANUEL STEWARD PASSES AWAY AT AGE OF 68!! « FOOTAGE OF DIDDY AFTER SERIOUS CAR CRASH IN LA!!! 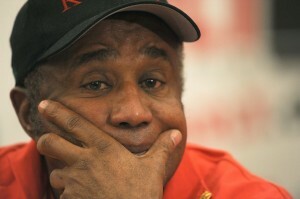 RIP TO ONE OF BOXING’S GREATEST TRAINERS+COMMENTATORS IN HISTORY: EMANUEL STEWARD PASSES AWAY AT AGE OF 68!! Famously known for being the trainer of Big Time Boxing Champions such as: Oscar De La Hoya, Lennox Lewis, Thomas Hearns & Wladimir Klitschko, and also for being the owner of the legendary boxing gym “KRONK GYM”, Emanuel Steward sadly passed away on Thursday OCtober 25th, 2012 at the age of 68. Steward was battling health issues for quite some time now, he was hospitalized in Chicago. At the moment no cause of death has been revealed. This entry was written by ANTST3R and posted on October 27, 2012 at 5:08 am and filed under Lifestyle, News, Sports. Bookmark the permalink. Follow any comments here with the RSS feed for this post.